A picture of the old Summerhill Rail road station in Summerhill. 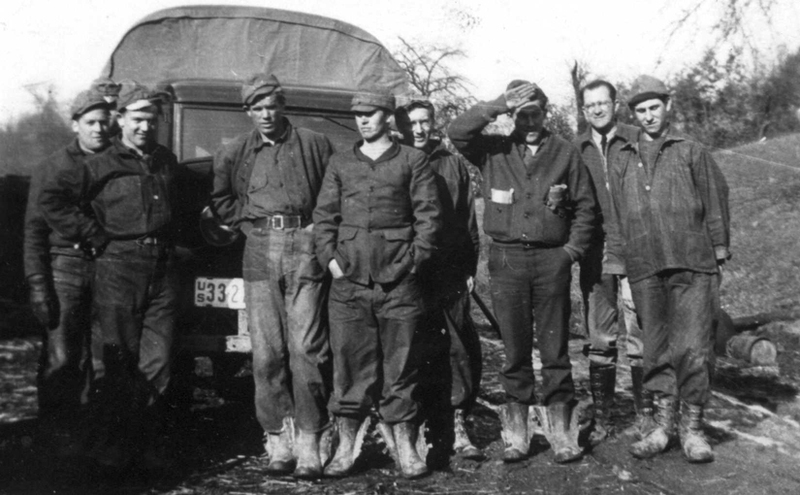 The four people in the picture are from left to right: Adam Bimle (Track Forman), Simon Robine (Ticket Agent), James Lynch (Baggage Master), Frank Dalton George (Boss). I think this picture was taken before 1920 , but I'm not sure. 1896 Voters: This circa 1896 photograph shows voters 90 or older. 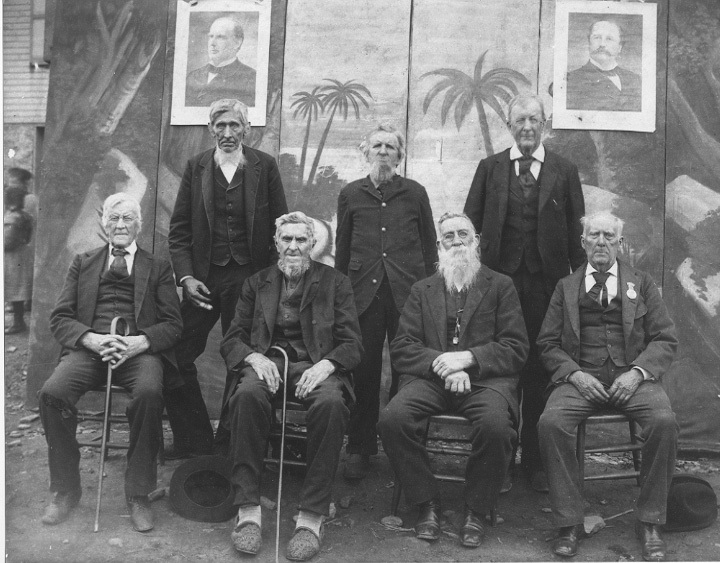 They are (front row, left to right) Abner Griffith, Mr. Knowlton, Joseph Hoffman, and Mr... Koontz, (back row) Levi Wissinger, Henry Constable and Eli Griffith. The portraits behind them are believed to be those of Presidents William McKinley and Grover Cleveland. The Mr... Koontz in the picture is George Washington Koontz. This photo is from the home of Ella Carnella Callihan (1884 - 1941). GALLITZIN JRS. 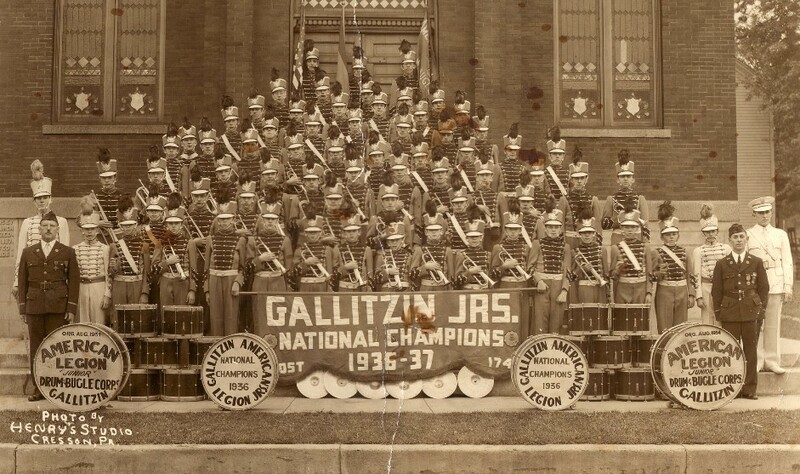 - National Champions 1936-37 - American Legion Drum & Bugle Corps. Harbison-Walker Refractories Co., Cambria Works, Blandburg, Pa. 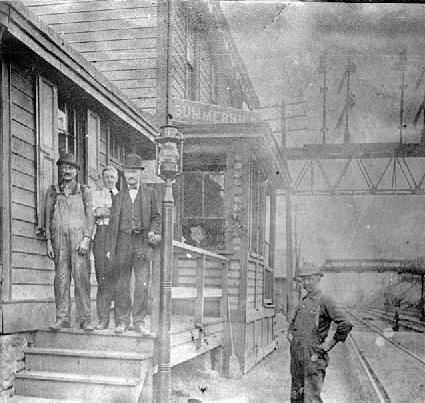 Reprint of an 1887 photo is of the men responsible for constructing the old Cambria Iron Works. 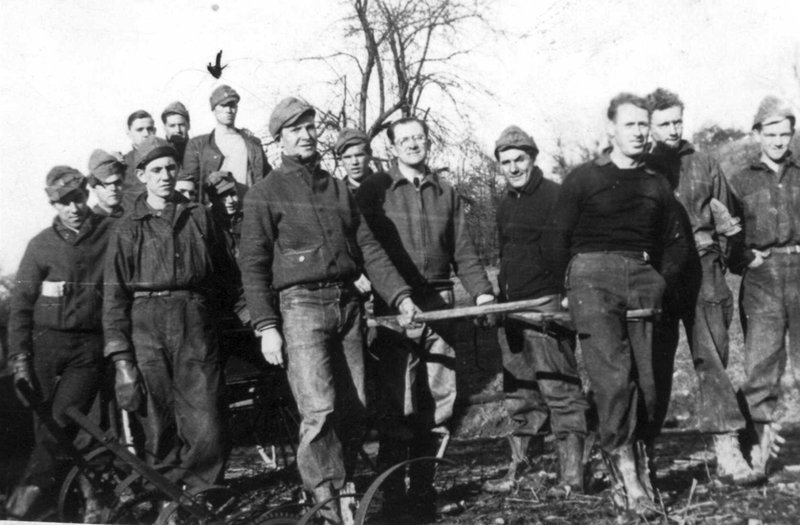 My great grandfather, August (Gus) Hauser is circled in the back row. 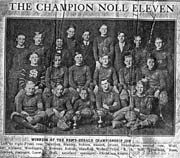 Winners of the News-Herald Championship Cup - 1917 - The Champion Noll Eleven - Left to right: Front row, Dalstrom, Matt Stanley, Robins, mascot, Orient, Pennington; second row, Wolf, Escher, Almassy, Weehagen, C. Kreman, Robins; standing, Weber, Price R. A. Noll, president, Rose, H. Teaman, manager, Loew, A. Stoll, assistant manager, Christison, Kosler. 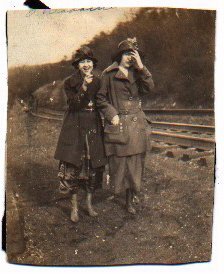 Picture taken At Railroad Cut near Williams Crossing Gallitzin Pa. Left to right My Grandmother Mini (Myers) Wess and a friend. About 1921. 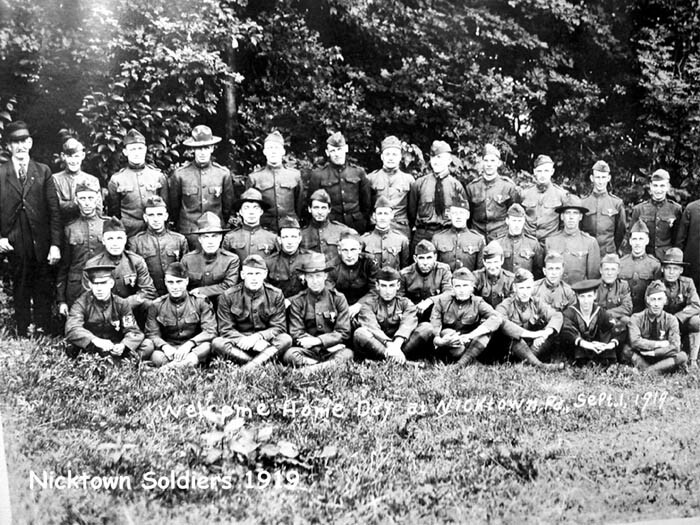 Co. H of the 5th PA National Guard of Johnstown during the Spanish-American War. This photograph is dedicated to the memory of Thomas A. Owens, Sr., who is speaking from the back of the station wagon. 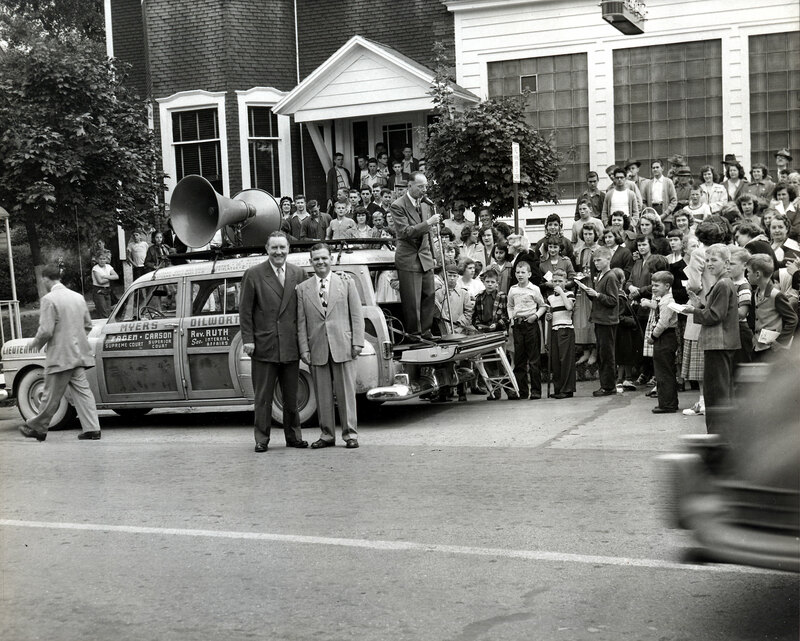 It is a photo of the county commissioners campaigning for Dillworth for governor in 1950 in front of the american legion in carrolltown. I believe the other two commissioners are standing in front of the wagon. 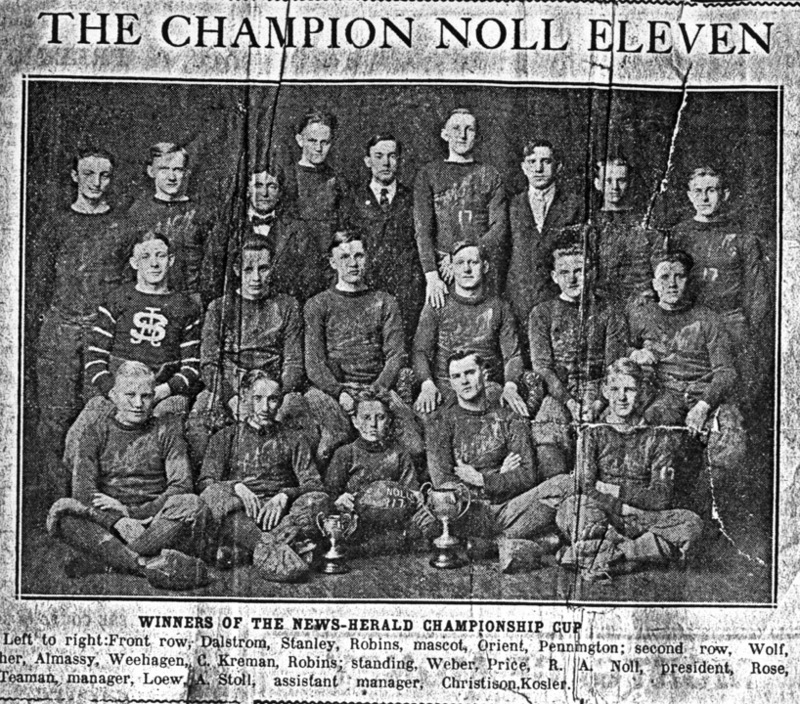 My father, Thomas Owens, Jr. is in the back row. For an even larger picture (1.4MB), click here. If you recognize anyone in the picture, please let me know. Company A, 628th Tank Destroyer Battalion, Johnstown, PA, circa 1950's. 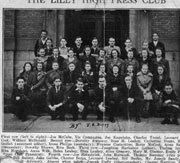 Lilly High School Press Club 1940. 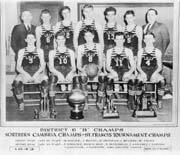 Mentioned are: Joe McCabe, Vic Campagna, Joe Kaputska, Charles Treml, Leonard ?, ? Cool, William McDonald, Dorothy Sweeney, Rose M. Leahey, Catherine Evans, ? Godish, Irene Philips, Frances Costantino, Betty McCool, Anna Sa?, Dorothy Rhawn, Rita Beck. Josephine Harkabus, Thelma In?, Rita Moreland, Anna Wilk, Helen Leahey, Elva Leahey, Alice Gregory, Mary M. Obestor, Emily P?, Joe Slebodnick, John Havanek, Thomas Sweeney, Bill Salony, Jake Gelbke, Chester Beres, Leonard Leahey, Bill Burke, Mr. Joseph Sandy, Joseph Duffy, Chester Hartline. Ebensburg, about 1907 or 1908. The gallows and the men who built it. The man on the left is my grandfather, Peter A. Melhorn. Unfortunately, I don't know who the other men are. Perhaps someone who visits your site will know. 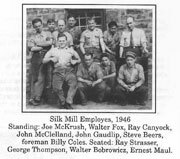 Standing: Joe McKrush, Walter Fox, Ray Canyock, John McClelland, John Gaudlip, Steve Beers, foreman Billy Coles. Seated: Ray Strasser, George Thompson, Walter Bobrowicz, Ernest Maul. Dutch Settlement Independents. Names on photo: Al Darstek, Henry Baith, John Favnesyi, Adem Bem, ? 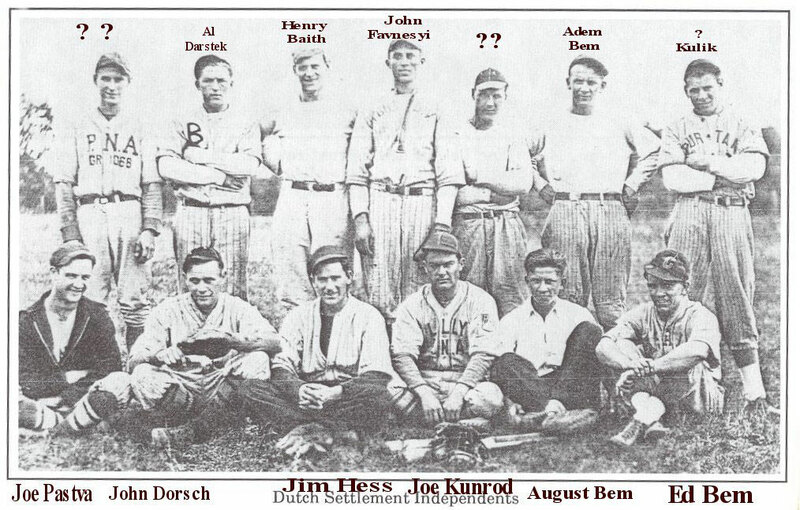 Kulik, Joe Pastva, John Dorsch, Jim Hess, Joe Kunrod, August Bem, Ed Bem. CCC, Shelocta, Pa. around 1935 or 1936. The arrow is pointing to Gerald Krug (1913-1993). None of the other gentlemen are identified. CCC, Shelocta, Pa. around 1935 or 1936. Carrolltown Volunteer Fire Department. 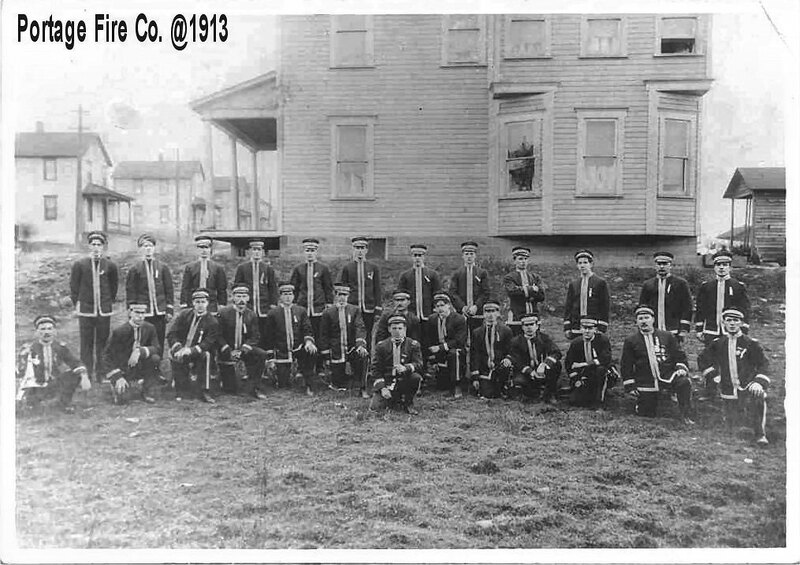 Caption reads: Early photo of 1930 firemen. 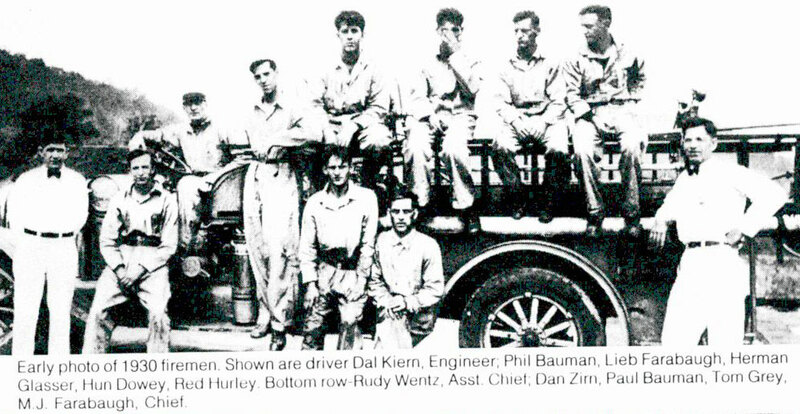 Shown are driver Dal Kiern, Engineer; Phil Bauman, Lieb Farabaugh, Herman Glasser, Hun Dowey, Red Hurley. Bottom row - Rudy Wentz, Asst. Chief; Dan Zirn, Paul Bauman, Tom Grey, M. J. Farabaugh, Chief. 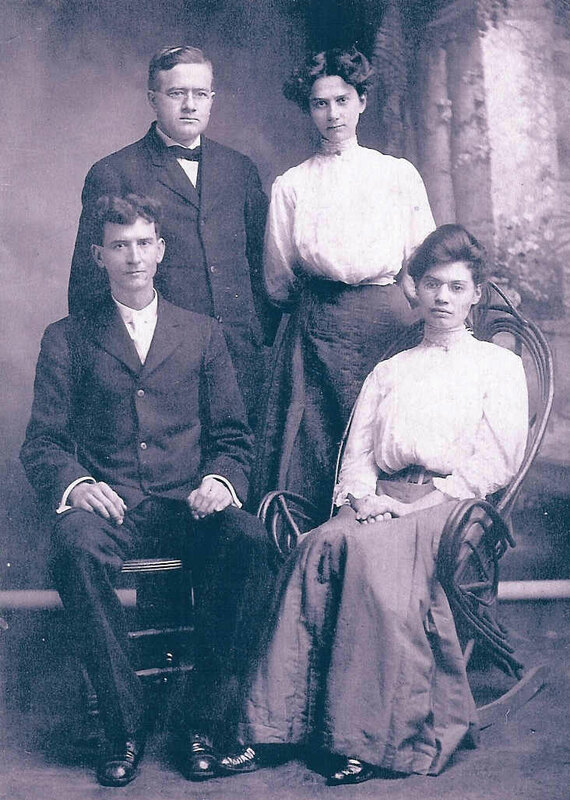 Photo of Luke Dunlap and Bertha Lehmier, 1907; Back row, unknown friend and Gertrude Dunlap. John Bionaz b. Feb 1868 Aosta, Italy. He was married to Orpheline Boche 24 Nov 1900 in Johnstown, Cambria, PA. There were the parents of 4 children, (all born in Cambria County): Charlotte b. 31 Mar 1901; Joseph Elere b. 7 Oct 1902; John Camel b. 21 Oct 1904 (baptized at St. John Gualbert, Johnstown; Evelyn b. 9 Apr 1910. John disappears from the family group in the 1920 census (son John is head of household Orpheline reports herself as married) and in 1930 Orpheline says she is a widow. In the picture John appears to be celebrating in a bar. Taken at Little Round Top, Gettysburg battlefield. 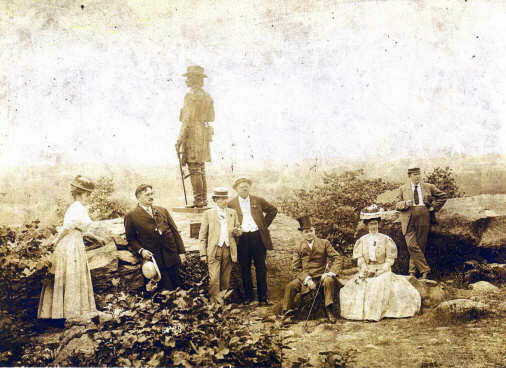 Left to right: Maggie Bailey O'Connor, wife of Judge Francis J. O'Connor who is leaning next to her, the man sitting in the top hat is the brother of Judge O'Connor, James B. O'Connor, Esq., the 3 men standing and woman sitting are unknown. Francis J. was a Judge of Cambria County and the former District Attorney of Cambria County around the turn of the century. The photograph was taken before 1911. 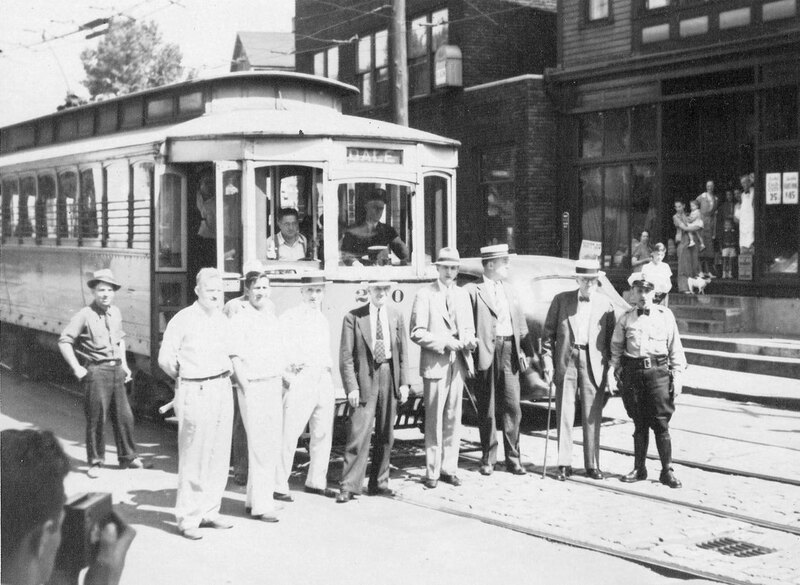 The last "Dale" Boro street car on Bedford St. August 2, 1940, Johnstown,Pa. 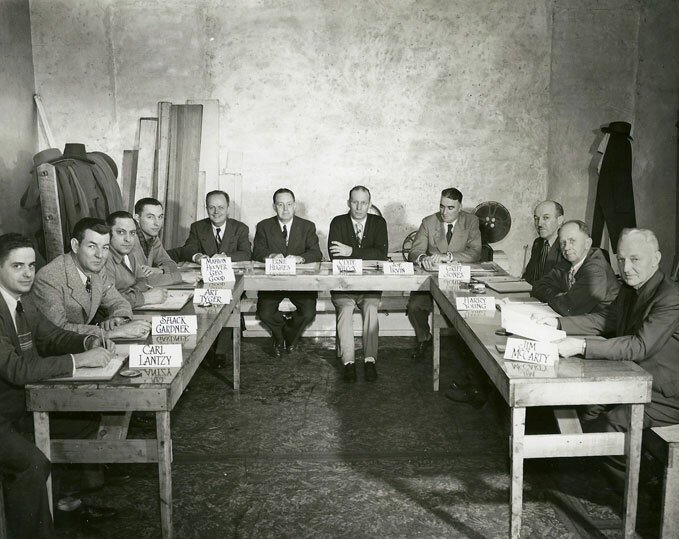 Pictured are: Daniel Forest, Motorman; Moore, Boro Engineer; John Cassler, Councilman; George Goebert, Treasurer; Howard Stull, Solicitor; Warren Rutz, Traction Co; Harry Fondelier; Arthur Bathurst, Traction Co; Charles A. Knipple, Chief of Police. G.A.R. 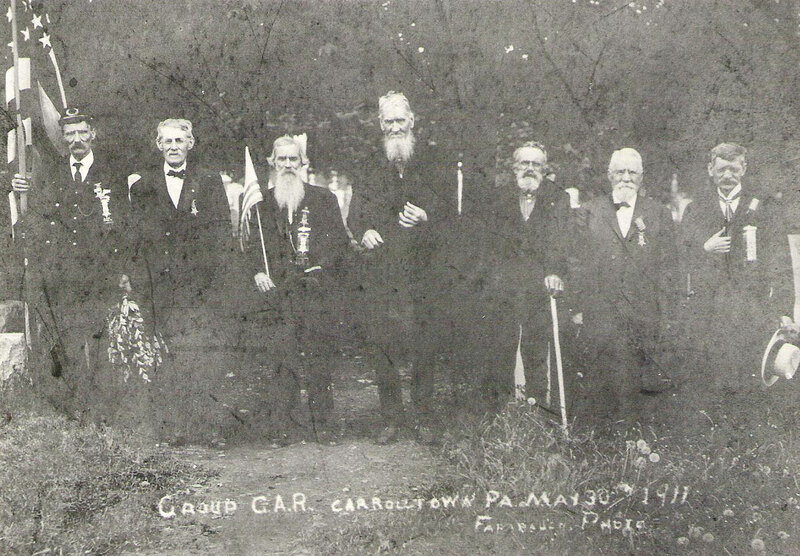 GROUP CARROLLTOWN, PA MAY 30, 1911. 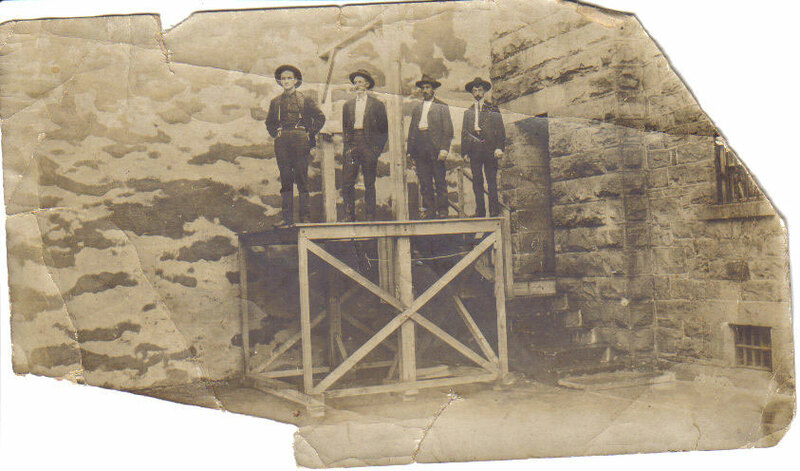 Photo was taken by Farbaugh Photo, and the gentleman 3rd from the left is my greatgrandfather James D. McMullen. I believe these are the officers of this G.A.R. 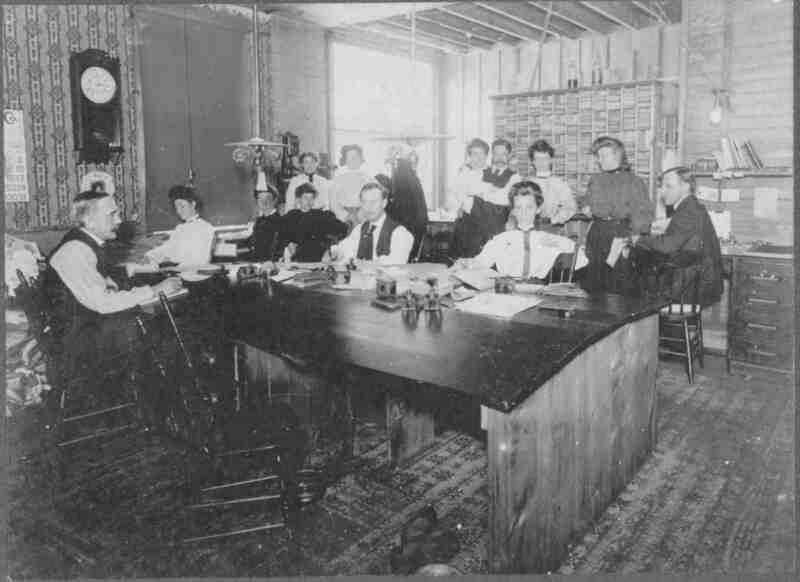 Group in 1911. If any one can identify any of these gentlemen, please contact Cathy Gray Baker at cbaker@hughes.net. 1921 Hastings funeral. In response to our weekly post card feature, we received this photograph from a reader for publication. 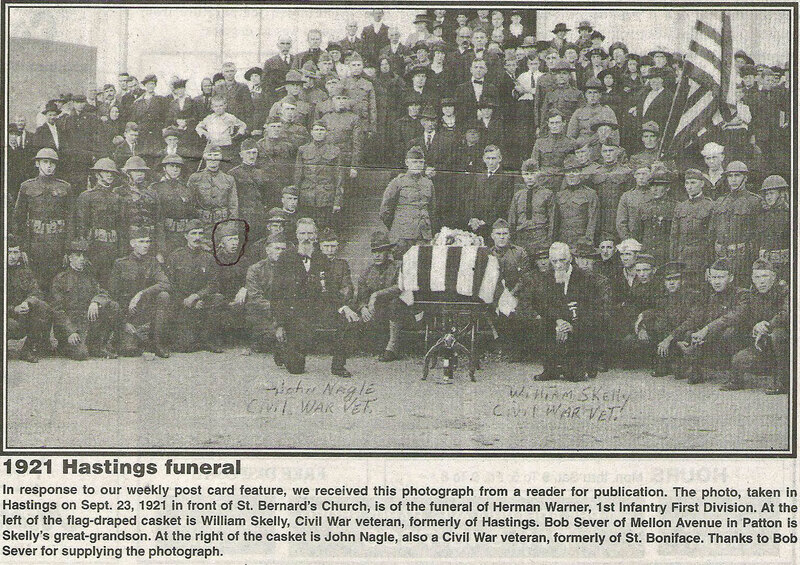 The photo, taken in Hastings on Sept. 23, 1921 in front of St. Bernard's Church, is of the funeral of Herman Warner, 1st Infantry First Division. At the left of the flag-draped casket is William Skelly, Civil War veteran, formerly of Hastings. Bob Sever of Mellon Avenue in Patton is Skelly's great-grandson. At the right of the casket is John Nagle, also a Civil War veteran, formerly of St. Boniface. Thanks to Bob Sever for supplying the photograph. 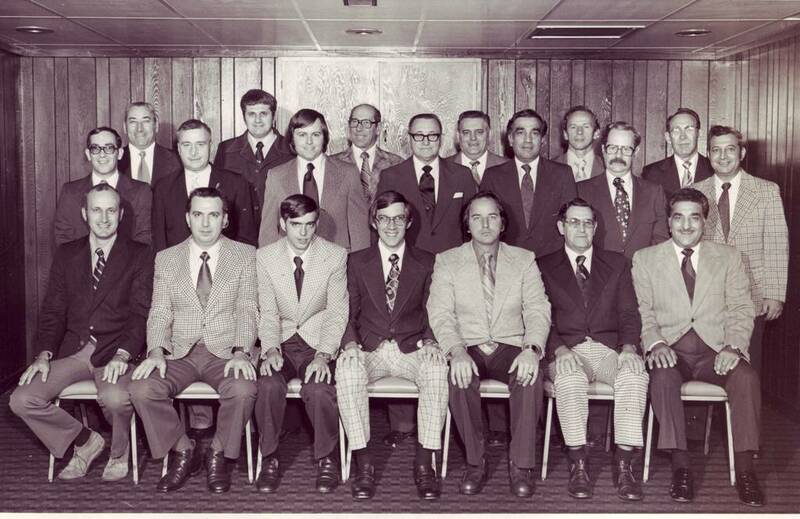 Bethlehem Steel Management Training Class, October 1976. May 6, 1954. Supt. 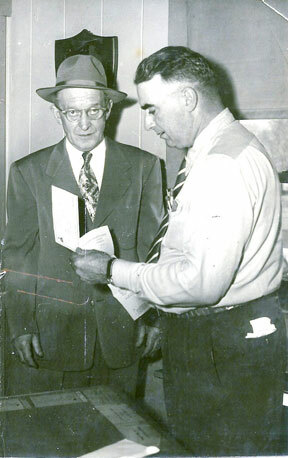 J.R. Irvin of Sonman Mines (at right) presents first pension check to Weldon J. Bumbaugh. Mr. Bumbaugh was Surface Foreman at Sonman Mine Koppers Division who retired May 1, 1954 after 39 years of service. He also was a next door neighbor in the two family company home in 'King's Row' that Mr. Irvin and his family occupied. J. R. Irvin was Koppers Div. Supt. of Sonman Mines, Sonman, Canbria Co., Pa. He took over in 1942 after the tragic explosion that took 63 men's lives until 1968 when the mine closed down. Joe rooted out the methane gas problem that caused the explosion and took the mine from the old method of mining with ponies and 19 Century methods into the 20th Century. 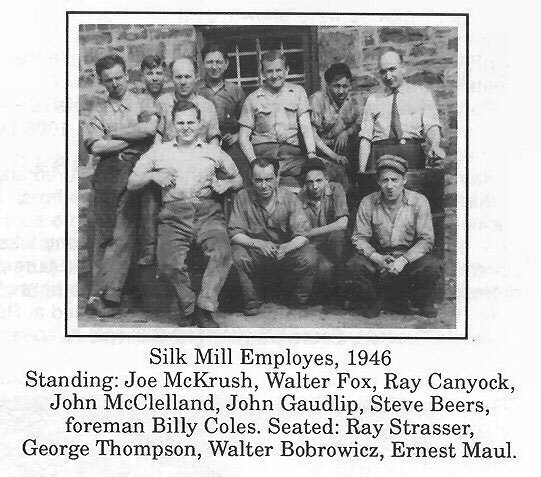 Dad started mining with his father as a child of 12 yrs.old, as did his ancestors as children in Scotland.He is shown here in the old Koppers Store and Mine Office with his Engineers, Foremen, Supply House Mgr.,and etc. We lived in a two family company house behind the mine so he could be hands on for any emergency along with most of the men shown in this picture. This row of homes was named "Suckers Flat' by the miners but was in fact named 'Kings Row' for the lumber 'King' that first timbered and lived there in a mansion before the mine was started in the 1800's.